Extracted from: "History of North-East Missouri"
The representative of an old Virginia family of French origin and one that figured in the history of our country prior to the Revolutionary period, Stephen Bedford Yancey has well upheld the family name and its long established prestige in this state. He is a man who has helped to make history in Randolph and Howard counties, and as such is eminently worthy of a place in a biographical and historical work partaking of the nature of this publication. 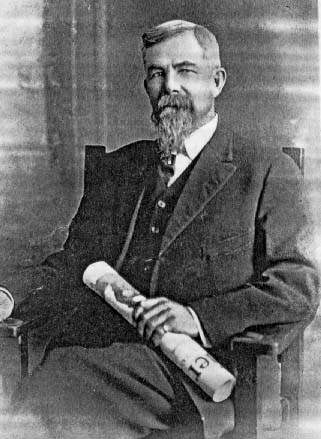 Born in the city of Springfield, in Green County, Missouri, Mr. Yancey is the son of Judge Charles S. and Mary (Bedford) Yancey, and his birth occurred on the 11th day of October in 1846. Concerning the parentage and ancestry of Stephen B. Yancey, it may be said that he comes of an old and honorable family of Huguenot origin, the same having been established on American soil in the earliest days of the British colonies. The grandfather of the subject was a native of one of the Carolinas, and was a near relative of the late William L. Yancey, of South Carolina. He was but fourteen years old when he participated in the War of the Revolution, and he was present at the battle of Yorktown when General Lord Cornwallis surrendered to the Continental army. More of exact date concerning the family is unavailable at this point, but sufficient is known to establish the family with all firmness among the first families of the nation. Judge Charles S. Yancey, the father of Stephen B., was born in Albemarle County, in Virginia, in the early part of the year 1800. The family had been long established in Virginia, and was one of considerable prominence and power in that state. The judge, be it said, was a self-made man. He studied law under Judge Todd at Columbia, was admitted to the bar and located in Springfield in 1833, where he gained considerable distinction in the legal fraternity. He was a man of strong magnetic power, with a pleasing personality, and came to be one of the leading attorneys of the state of Missouri. He became circuit judge of his district in 1842-3, and was the first man south of the Missouri River to sentence a man to the gallows. The prisoner, when asked if he had anything to say, replied: "Nothing, Judge, only that you have been fair and merciful to me." He was a man of sterling integrity, clearheaded and of acknowledged ability in the law, and always fair and honorable in his rulings. When yet a young man Governor Boggs., in 1836, appointed him colonel of the state militia, Find with a regiment of soldiers removed the Indians from Southwest -Missouri to their reservation in the Indian Territory. So skillfully was his task accomplished that the governor openly expressed his pleasure ', Find the Indians ever after regarded him as their best friend. Judge Yancey, was one of the most prominent public speakers in Missouri, and one of the leading statesmen of the commonwealth, and as such bad been recognized for many years prior to his death. He was serving his third term as judge and had often been solicited to stand for congress. Had he lived his friends say he would have been governor of the state. He died in 1856, in the very prime of his manhood when he was about forty-six years of age. He married Mary Bedford, the daughter of one of the finest families of Boone county, Missouri, and a woman of superior intellect and character. A notable event of this wedding is that Mary Todd, afterward the wife of President Abraham Lincoln, acted as bridesmaid for Mary Bedford. Mrs. Yancey's father was Stephen Bedford, one of the pioneers and most prominent men of his section of the state for many years. When the judge died he left three children: Anna Rozelle, Stephen B., of this review, and Robert, who served as a soldier in the Confederate army under General Price and died soon after peace was declared, being but sixteen years old at the time of his death. The wife and mother died one year previous to the passing of the judge, and from her death he never seemed able to recover. Judge Yancey was ever the champion of the people, and he maintained their enduring faith and love to the last. When he died the populace, felt that they had lost a friend, and if was indeed go, and for years after his friends recounted his many virtues and dwelt upon his loyal and unswerving friendship. turned his attention to farming on a small scale. His operations have been extended from year to year, and he has made a splendid success of that industry. In connection with his son. C. E. Yancey, and his son in-law, W. R. Evans, be now owns five of the finest farms in the vicinity of Armstrong, and these comprise a total of thirteen hundred acres of highly improved and immensely valuable land. Modern houses, expansive barns and other buildings grace his properties, and his spreading blue grass pastures are stocked with high bred cattle, hogs, sheep and horses. He makes a specialty of the far-famed Missouri mule, of which he is the most extensive handler in this locality, holding the distinction of producing end selling the highest priced two-year-old mules, ever sold in the state. Full of energy, optimistic in all things and still retaining the fire of big youth, he has lived to see the farmer in Missouri come into his own, and he is known to be one of the most advanced farmers in the country, adhering to scientific and proven methods and not averse to experiments when conditions seem to demand them. He gives the closest attention to soil culture, returning to his fields in the way of fertilizers everything taken from them. His Burch Farm contains five hundred acres of fertile and highly cultivated land; the Mell Farm has 170; the Crescent Hill Farm 230 acres, and the Broad Moor Stock Farm, where he wrought for twenty years of his young married life and laid the foundattions of his future success, contains four hundred acres. All lie between Roanoke and Yates stations in Randolph county, and the group is considered to be the finest that may be found in this part of Missouri. Mr. Yancey has two of the best residences in Armstrong, furnished and maintained in a manner indicating the excellent taste of himself and his family. Mr. Yancey is a man of the keenest, intelligence and of broad and progressive views. Not only as it farmer and a stockman has he been successful, but the banking business has known his activities and operations for many years, and he has proven himself to be a financier of no mean abilities. Mr. Yancey was the promoter of the Farmers' Bank of Armstrong and was its president and cashier for twenty years. The death of his son in 1906, who had for years been assistant cashier of the bank, was a blow that almost felled the father to the earth. His right arm was gone and so stunned and discouraged was he that for a time he retired from all business. But to stop and idly brood over his loss was foreign to the strong and healthy nature of the man. Inactivity palled upon him, and returning to business again, he invested his surplus capital entirely in farming lands. During the years of his official connection with the bank, he showed himself to be a man of splendid busi capacities, with executive abilities far in excess of those of the average man, and he made a name for himself in financial circles equal to that which he had established in the agricultural industry. Two years ago he assisted his neighbors in organizing the Yates Savings Bank, capitalized at $15,000. The bank furnishes all necessary banking facilities for the territory in which his holdings are located and is a well conducted and thriving institution of its kind. In 1867 Mr. Yancey married Miss Sarah Viley, the daughter of Judge John Viley, a southern gentleman of the old school, and one of the most popular and prominent of men in Randolph county. His fortune of twenty thousand acres of land and innumerable slaves was swept away by the war. She is a woman of fine character and mental attainments, and for almost forty years she has participated in his triumphs and defeats. As a matron in her snowy kerchief, she. still reveals to hint the form and face of his sweetheart of long ago, and to her unfailing devotion he cheerfully acknowledges his indebtedness for all of success that has come to him through the years of their comradeship. She became the mother of four children, named as follows: Charles E., a prominent farmer and stockman of Clay county, Missouri; William B., who was educated at William Jewell College, in Liberty, Missouri; he was for some years assistant cashier of the Farmer's Bank of Armstrong, as mentioned above, and was a young man of the most worthy character and loved by all for his kindly and genial disposition and his many striking qualities of heart and mind. He died in 1906 at the age of twenty-five years, while yet the glory of youth shone upon his brow, and life was sweet and beckoning. His bereaved family are rich, indeed, in the memory of his kindly deeds and the tender and loving service that was closed all too soon by his untimely passing. The other children are Elizabeth, the wife of William R. Evans, of Howard county, and Rozzelle, who died at the age of five years. Politically, Mr, Yancey has always affiliated with the Democratic Party but has never sought political preferment, though often, in younger life, in demand. In church relations he is a Baptist. Loyal to the church he joined in youth, his hand and heart have always responded to the calls of his denomination. A friend to education, he not only gave his children all of the advantages to be obtained in our best schools, but many young men, who heeded his advice, "put your money into brains, " felt the touch of timely aid and today are occupfinig places of profit and trust in his state - at least one has gained a national reputation. Faith in himself and faith in humanity, no obstacle has deterred and no success has unduly elated. His fine, courageous spirit has led him into an unobtrusive, retiring and busy life.